It has been quite a while since I posted anything and I believe it is time to get started again. Even though the holidays are past and we are well into 2018, let me wish you a happy and a healthy new year. My yearly calendar is out and has shipped to all who placed orders. Having pneumonia and the slow recovery afterwards put me over a month behind, but thankfully, the calendar has still nearly sold out. 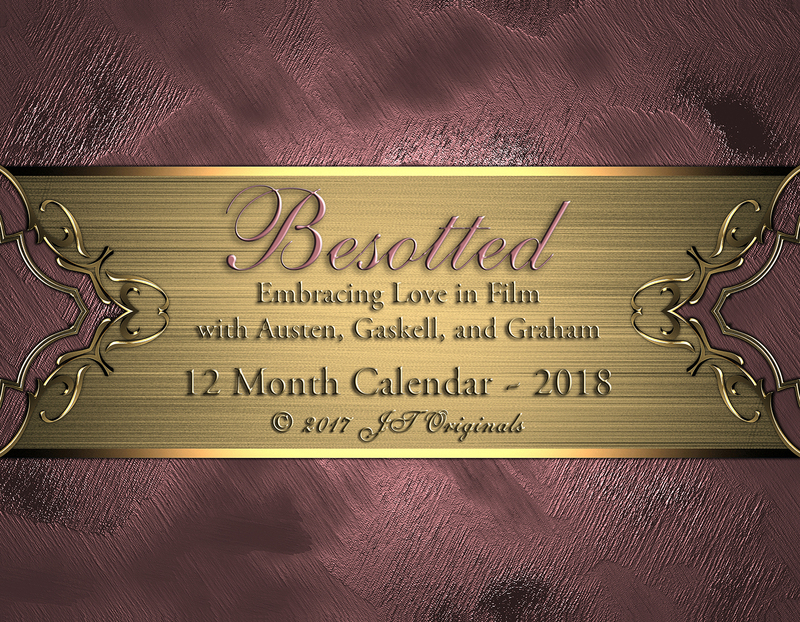 'Besotted' pays tribute to Austen, Gaskell, and Graham, their books, the movies based on those books, and the actors portrayed in the films. The paintings in 'Besotted' are my artistic interpretations of scenes from the different movies. The pictures for the months are paintings from photographs I took of favorite or special scenes in the movies. Some of the scenes I created by putting the two characters together in a scene. Although they were both in the scene, they were not shown together in the way that I wanted to interpret the scene. The picture from Mansfield Park was a fluke of photography. I happened to capture two scenes together. I wasn't aware of it until I was looking at the pictures after the shoot. I loved how the camera caught the two separate scenes and made them into one. After choosing which photo I would use, I changed each picture into an Impressionist painting, using Corel Painter. The brush strokes show up more on some than on others, but they are there. It was fun making the paintings and adding more strokes where needed. Sometimes I would smooth over some rough edges or eyes, if necessary, taking out a few strokes. to see it in actual size. If you have not watched the North & South miniseries by Elizabeth Gaskell, I highly encourage you to do so. Of all the embraces and 'love realized' scenes from the movies illustrated, this one was/is my favorite. Wow! That is a kiss! I have watched the ending as many times, if not more, than the ending scenes of the 1995 Pride and Prejudice miniseries. I also recommend reading the novel, North & South. The movie depicts John Thornton rather harshly in the scene when John and Margaret meet. That particular scene is not in the book at all. The book gives us such insight into the thoughts and feelings of John Thornton, and Richard Armitage does an excellent job of showing them with subtle nuances. All of the movies in the calendar are so good and I enjoyed re-watching every one. 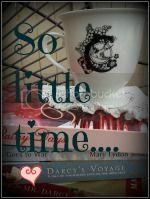 The calendar has quotes and promotions from many JAFF authors. Some showcase books that will be released later this year. I hope you enjoy reading the quotes as much as I did. That is quite a line-up, isn't it! There are many books to peruse and quotes to enjoy. These authors are giving us some fine reading time. I want to say a special thanks to Minuteman Press in Georgetown, Texas. They have been printing my calendars for the past four years. Yvonne, Andy, and Michelle, thank you for all you do to make the calendar possible. Yvonne, you are my first go-to person and your help is 'priceless'. Andy, you are my hero! You always work extra hard to get the color to print like I want it to look. I know we have the same vision of how it should be and I trust you implicitly to make that vision a reality. Michelle, your final touches give the calendar that finished look that makes it professional. Thank you all for caring and wanting to help me make my calendar the best it can be. Thanks for stopping by. Feel free to have your share in the conversation. Be watching next week for my favorite books from 2017!